Believe it or not, the Apple iPhone 4 and the GSM flavored version of the Apple iPad 2 are both less than a month away from being banned in the U.S. by the ITC. Apple is seeking to halt the ban, which goes into effect on August 5th following a 60 day review period by the President of the United States. The presidential review period starting counting down on June 4th, when the ITC initially imposed the order, and while other Apple devices were part of the import ban, only the Apple iPhone 4 and the Apple iPad 2 (GSM) are still being sold by Apple. The president is not expected to interfere in the case. You might think that this is not a big deal considering that the Apple iPhone 4 originally launched in 2010. But Apple has kept it around as an entry-level device and it was the fourth most popular smartphone in the U.S. during 2012. Many carriers have resorted to giving it away for free with a signed two-year contract, but that is all in jeopardy. Back in June, the ITC ruled that the Apple iPhone and Apple iPad both infringed on a Samsung patent related to encoding. That led to an automatic import ban order from the ITC. Now, with the prospect of having two of its devices banned from entry into the U.S., Apple is seeking to win a last second reprieve. The Cupertino based manufacturer says that the ban will "sweep away an entire segment of Apple’s product offerings," and will also harm the carriers that sell those devices. Apple argues that the Federal Circuit Court of Appeals, where it is appealing the ITC ruling, is going to rule that the Samsung patent that Apple infringed on (according to the ITC) is invalid. It also says that even if the appeals court rules in favor of Samsung, an import ban isn't needed because Samsung could win damages in a similar case taking place in Delaware court. If you like to dress up and play lawyer, you can check out the filing below. Samsung's financial gain isn't my own, but dang, I'm happy to see Apple getting a taste of its own nasty medicine. Bad Apple... Bad, bad Apple... Stop being bad, or see what happens. Well, this is pretty unbelievable. The general perception is overwhelmingly that of Samsung being the prey and under constant fire.. but wow look at this. Apple got it blowing back right in their faces! 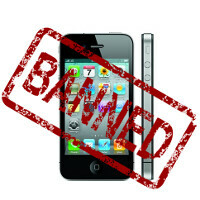 Two of Apple's most iconic products, the ones that made them what they are, got banned at their own turf! Unfortunately in the U.S. government officials love Apple so I doubt the ban will go into effect and Apple won't learn their lesson. Sue everybody and you will be sued. They deserve it. Sounds like Karma on Apple. Get back in the lab apple. Focus on the fall lineup. am i the only one that kinda feels bad for apple i mean haha u got what was coming but until the ip5 came out apple was pretty good that was when they were innovative and a good company if anything ban the new crap. Am i alone on this notion ? OK, I'm sure there used to be a thumbs-down button. What are we now, like the kids' leagues where everyone gets a trophy? If I could've given you 10 thumbs up I would have. This is almost comical-Apple has the audacity to try and halt a ban to their inferior Iphones because it could harm their precious company yet they've been suing everyone who makes a better product which is basically any smartphone that's not Apple! That's what happens when you keep sticking your nose into everyone else's business Apple, if you had left Samsung alone, no one would have found out about the patent's your company infringed on!! Payback, payback, payback! :) Of course we know that Apple won't get their products banned since they have the money to buy their way out of anything, still won't help them outsell android, the world's best and largest os!! You see Mr. Cook sit by the first lady and the prez useing ipad? I don't think this ban will happen. So Apple is gonna hide behind the White House's skirt hoping to be protected? Ahhh, America the Corporatocracy, more concerned with publicly traded companies than with its own private citizens. This ban is not going to happen, Apple has a few billion reasons to stop it..wink wink.